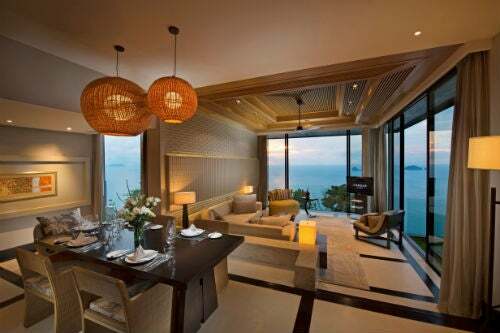 Conrad Koh Samui has announced its newest luxury residence, the Oceanview Three Bedroom Pool Villa. With the most discerning travelers in mind, this residence will create a memorable experience for those who appreciate the finest in resort living. Situated on the south west tip of the island, Conrad Koh Samui provides a relaxing retreat with great views of Koh Samui’s fabled five islands and its majestic sunset. The newest residence, Oceanview Three Bedroom Pool Villa, is located at the top of the resort, offering a breathtaking panoramic ocean view of the Gulf of Thailand. The luxuriously appointed Oceanview Three Bedroom Pool Villa is set over two levels with 829 square meters of indoor and outdoor living space, perfect for families or friends who wish to share the ultimate vacation experience. The upper level entrance opens onto a private outdoor lawn terrace, perfect for pre-dinner cocktails while taking in the ocean views and exquisite Samui sunsets. This level also includes an open-plan living and dining area, contemporary bar, private kitchen and a spacious sundeck with an al-fresco dining area. The master suite, two junior suites, private pool and outdoor deck are located on the lower level. The master suite boasts its own living area with a 42-inch plasma TV, stylish circular bed, private study, and a walk-in closet. The adjoining bathroom is a masterpiece on its own featuring a sunken circular tub, outdoor shower and jacuzzi. The two junior suites complete with king-sized beds and open directly onto the large pool terrace. Tropical motifs are combined with subtle Thai influences and contemporary design to create a unique décor featuring rich tones and natural textures. With absolute classic in resort design, this residence is positioned to provide a premium experience for families or groups seeking the ultimate tropical destination. This luxurious villa, with probably the best views in Thailand, is priced at THB 198,800 plus applicable tax and service charge. 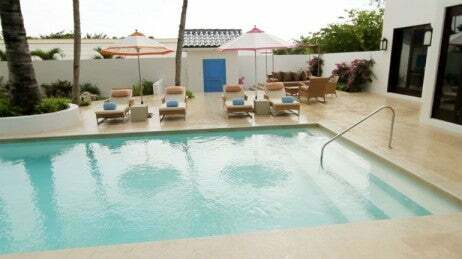 This rate is per villa, per night inclusive of breakfast for up to nine guests, round trip airport transfers, a complimentary laundry service (excluding dry cleaning), inflatable toys for the pool, and a 24-hour butler service. In addition, a private chef and grocery shopping service is available on request.